Background and Objectives: Hemophagocytosis in bone marrow aspirates is fairly common and can be observed in a spectrum of clinical conditions. This study aimed at evaluating the clinicopathological profile of patients showing hemophagocytosis on bone marrow aspirates examined for varied clinical indications. 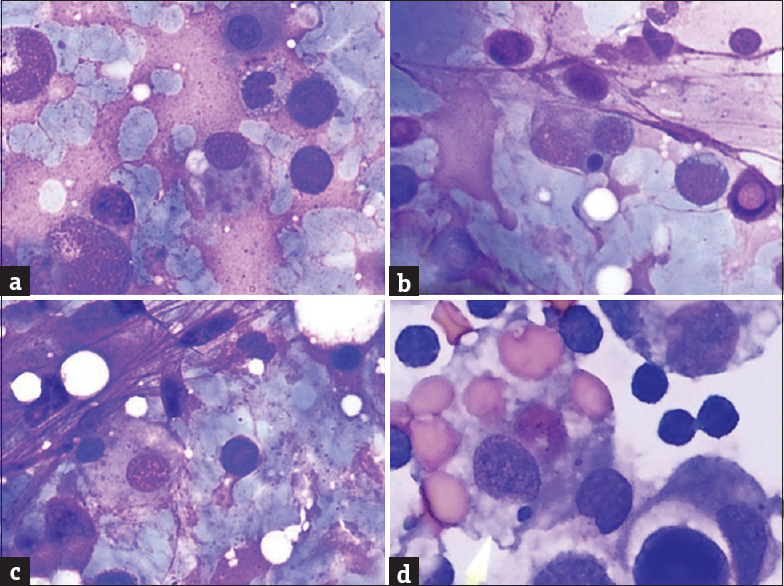 Materials and Methods: In this study, all those bone marrow aspirate smears sent with various clinical indications and which showed hemophagocytosis were included. Finally, 25 bone marrow aspirates were studied. Results: Of 25 patients, 18 (72%) were males and 7 (28%) were females. The age of the patients ranged from 2 to 73 years. Two common clinical indications with which bone marrow aspirates were sent were fever of unknown origin 10 (40%) and HIV-positive patients with cytopenias 7 (24%). Anemia was the most common cytopenias observed followed by cytopenias in other combinations. Microcytic hypochromic anemia was the common morphological type of the anemia encountered in these patients 17 (68%). Twenty-three (92%) of the bone marrow aspirates showed cellular bone marrow with features of hemophagocytosis. Bone marrow aspirate from a HIV-positive patient showed erythroid hyperplasia (78% early erythroids) with giant erythroblasts and features suggestive of parvovirus B19 infection and hemophagocytosis. Conclusions: Hemophagocytosis in the bone marrow aspirates should not be overlooked and always be documented and reported. The presence of hemophagocytosis may be the only clue to the underlying conditions such as systemic infections or hemophagocytic lymphohistiocytosis (HLH). It is therefore recommended that every case which shows hemophagocytosis needs to be reported and further workup be done to confirm the diagnosis of HLH. Hemophagocytosis is the pathologic process of engulfment of erythrocytes, leukocytes, platelets, and their precursors by the histiocytes, either in the bone marrow or in other parts of the reticuloendothelial system. These syndromes result from macrophage activation with increased number of hemophagocytic macrophages and peripheral blood cytopenias. The phenomenon of hemophagocytosis is a common pathologic feature observed in the bone marrow aspirates sent for examination with various clinical conditions. Many a times, its presence is overlooked and is not documented in the report. Reporting of hemophagocytosis on the bone marrow aspirates becomes critical as the further management of the patient depends on the cause of hemophagocytosis. Hemophagocytic syndromes occur commonly secondary to bacterial or viral infections. They either occur in previously healthy individuals or as a terminal complication in patients with altered immune response. The next common cause of hemophagocytic syndrome is hemophagocytic lymphohistiocytosis (HLH). HLH is a disease which poses diagnostic and therapeutic challenges, and it occurs in primary and secondary forms. Distinguishing both is the most important prerequisite in the management. The primary form is a fatal disease with a median survival of <2 months after diagnosis if untreated. The secondary form occurs as a result of strong immunological activation of the immune system. Therefore, the index study was conducted with an aim to evaluate the clinicopathological profile of patients showing hemophagocytosis on the bone marrow aspirates examined for various clinical indications and to assist a clinician in carrying out further workup on such patients to differentiate primary and secondary causes of hemophagocytosis. This descriptive, cross-sectional study was carried out in the hematology section of the Department of Pathology, Armed Forces Medical College, Pune, India. All those bone marrow aspirate smears sent to the department with various clinical indications from June 2015 to May 2017 and which showed hemophagocytosis were included in the study. Finally, 25 bone marrow aspirates were included in the study. Clearance of the institutional ethical committee was obtained for the conduct of the study. The bone marrow aspirate smears were fixed with methanol for 10 min, followed by staining being carried out with Giemsa-Wright stain as per the standard protocol. The aspirates were initially scanned for the cellular trail and for any obvious pathology, under low power ×4 and ×10 view. Later, 500 consecutive nucleated cells were counted under oil immersion objective ×100 for cytomorphological details and evidence of hemophagocytosis. Even a single histiocyte showing hemophagocytosis was considered positive; however, the phenomenon was not graded in this study. In the presence of hemophagocytosis, the aspirate smears were searched thoroughly for the presence of hemoparasites and for any hematolymphoid malignancies. The demographic profile and the indication for the bone marrow aspirate were noted from an investigation requisition form sent along with the specimen. The peripheral blood sent along with the bone marrow aspirate was aspirated, and the complete blood count was obtained using Sysmex-XT 2000i fully automated hematology analyzer. Peripheral smears were prepared in 100% of the cases for the assessment of cytopenias; morphology of red blood cells, white blood cells, and platelets; identification of acute/chronic leukemias or any hemoparasites. The presence of hemophagocytosis was endorsed in the bone marrow aspirate reports, and the clinicians were advised to carry out further investigations to stratify the patients as primary versus secondary hemophagocytosis. The clinicopathological profile of the patients was tabulated and interpreted. Microsoft Excel was used for compiling the basic data and statistics. We studied the peripheral blood counts, peripheral blood smear, and bone marrow aspirates of 25 patients who demonstrated hemophagocytosis in the marrow aspirates. Of the 25 patients, 18 (72%) were males and 7 (28%) were females. The age of the patients ranged from 2 to 73 years. Most of the patients 16 (64%) were in the age group of 21–60 years. 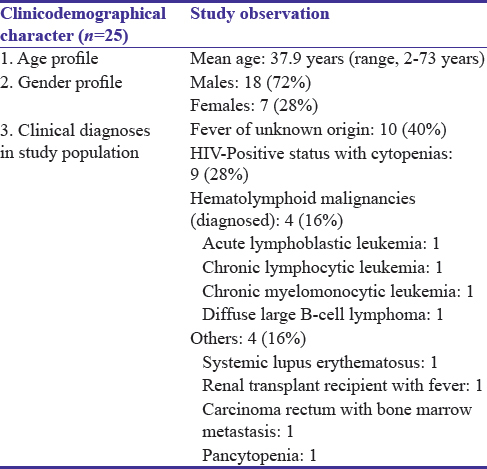 Two common clinical indications with which bone marrow aspirates were sent for examination were fever of unknown origin 10 (40%) and HIV-positive patients with cytopenias 7 (24%), followed by the other causes [Table 1]. Anemia was the most common cytopenias observed in these patients. All the 25 (100%) of the patients had anemia. Eight (32%) patients had only anemia. Eight (32%) patients had pancytopenia. 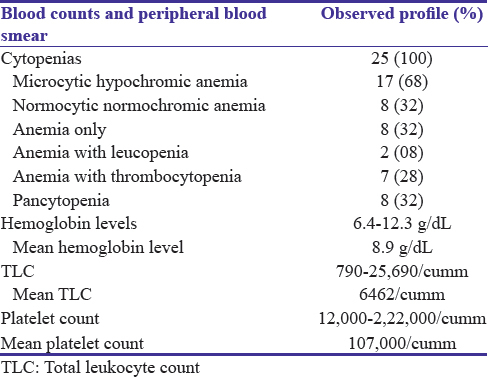 Seven (28%) patients had anemia with thrombocytopenia, and two (8%) patients had anemia with leukopenia. Microcytic hypochromic anemia was the common morphological type of the anemia encountered in these patients 17 (68%), followed by normocytic normochromic anemia 8 (32%) [Table 2]. Twenty-three (92%) of the bone marrow aspirates showed cellular bone marrow with features of hemophagocytosis. Representative pictures of bone marrow aspirates of cases under study are depicted at [Figure 1]. Bone marrow aspirate from an HIV-positive patient showed erythroid hyperplasia (78% early erythroid) with giant erythroblasts and features suggestive of parvovirus B19 infection and hemophagocytosis. The clinician was advised to carry out the requisite diagnostic test to confirm the infection. One bone marrow aspirate from a known case of chronic lymphocytic leukemia on maintenance chemotherapy showed hypocellular bone marrow with hemophagocytosis. Fifteen (60%) of the patients showed increased bone marrow plasma cells (>3%). The plasma cell percentage ranged from 0% to 10% [Table 3]. Hemophagocytosis is the pathologic process of engulfment of erythrocytes, leukocytes, platelets, and their precursors by the histiocytes, either in the bone marrow or in other parts of the reticuloendothelial system. The syndrome of hemophagocytosis has to be first recognized as whether a primary disease or secondary to an underlying reactive process. This is critical for the line of management and has prognostic value. 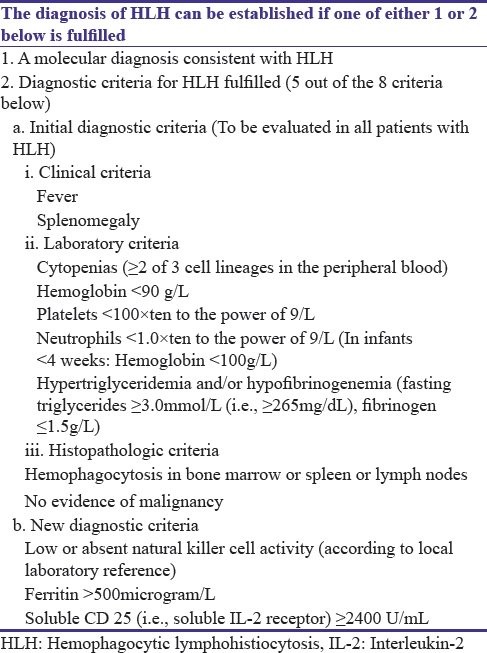 The causes of primary and secondary hemophagocytosis are listed in [Table 4]. The separation has to be done using the revised diagnostic guidelines HLH-2004. The diagnostic criteria are reproduced in [Table 5]. Secondary HLH is more common to occur than primary HLH. The diagnosis of HLH can be made if there is a family history of HLH or evidence of genetic defects or if five of eight clinicopathological criteria are fulfilled. The challenge of separating primary from secondary hemophagocytic lymphohistiocytosis (HLH) is always present. In our study, 25 bone marrow aspirates sent for examination for various clinical indications showed the presence of hemophagocytosis. The common presenting features in these patients were fever and cytopenias. All the patients had anemia. In a study of six patients with HLH by Goel et al., the presence of hemophagocytosis in the bone marrow had a sensitivity of 83% in detecting HLH. The presence of hemophagocytosis in the bone marrow aspirates should be the guiding principle for further workup to rule out HLH. In our center, the bone marrow aspirates showing hemophagocytosis are reported with advice for carrying requisite tests required to satisfy the HLH-2004 criteria. Other clinical diagnoses in which bone marrow aspirates showed hemophagocytosis were various hematolymphoid newly diagnosed malignancies and also those on chemotherapy (1 case of acute lymphocytic leukemia on maintenance chemotherapy, 1 case of chronic lymphocytic leukemia on maintenance chemotherapy, 1 freshly diagnosed case of chronic myelomonocytic leukemia-II, and 1 case of newly diagnosed case of diffuse large B-cell lymphoma). Multiple studies acknowledge the occurrence of secondary HLH in hematolymphoid malignancies and also as a consequence of chemotherapy. Hemophagocytosis is a fairly common phenomenon; however, it should not be overlooked and always be documented and reported. The presence of hemophagocytosis may be the only clue to the underlying conditions such as systemic infections or HLH. It is essential to suspect and diagnose HLH early as the condition can be life-threatening. Diagnosis of HLH requires clinical and laboratory criteria to be met. This study therefore concludes that every case which shows hemophagocytosis on the bone marrow needs to be reported and further workup be done to confirm the diagnosis of HLH so that the patients can be timely and appropriately managed. Favara BE, Jaffe R, Egeler RM. Macrophage activation and hemophagocytic syndrome in Langerhans cell histiocytosis: Report of 30 cases. Pediatr Dev Pathol 2002;5:130-40. Bain BJ, Clark DM, Wilkins BS. Bone Marrow Pathology. 4th ed. Wiley-Blackwell; 2009. Chandra H, Chandra S, Kaushik R, Bhat N, Shrivastava V. Hemophagocytosis on bone marrow aspirate cytology: Single center experience in North Himalayan region of India. Ann Med Health Sci Res 2014;4:692-6. Goel S, Polski JM, Imran H. Sensitivity and specificity of bone marrow hemophagocytosis in hemophagocytic lymphohistiocytosis. Ann Clin Lab Sci 2012;42:21-5. Oliveira C, Chacim S, Ferreira I, Domingues N, Mariz JM. Secondary hemophagocytic syndrome: The importance of clinical suspicion. Case Rep Hematol 2014;2014:958425. George MR. Hemophagocytic lymphohistiocytosis: Review of etiologies and management. J Blood Med 2014;5:69-86. Park KH, Yu HS, Jung SI, Shin DH, Shin JH. Acute human immunodeficiency virus syndrome presenting with hemophagocytic lymphohistiocytosis. Yonsei Med J 2008;49:325-8. Campbell JI, Kanters S, Bennett JE, Thorlund K, Tsai AC, Mills EJ, et al. Comparative effectiveness of induction therapy for human immunodeficiency virus-associated cryptococcal meningitis: A network meta-analysis. Open Forum Infect Dis 2015;2:ofv010. Janka GE, Lehmberg K. Hemophagocytic lymphohistiocytosis: Pathogenesis and treatment. Hematology Am Soc Hematol Educ Program 2013;2013:605-11. Maakaroun NR, Moanna A, Jacob JT, Albrecht H. Viral infections associated with haemophagocytic syndrome. Rev Med Virol 2010;20:93-105. Padhi S, Ravichandran K, Sahoo J, Varghese RG, Basheer A. Hemophagocytic lymphohistiocytosis: An unusual complication in disseminated Mycobacterium tuberculosis. Lung India 2015;32:593-601. Cançado GG, Freitas GG, Faria FH, de Macedo AV, Nobre V. Hemophagocytic lymphohistiocytosis associated with visceral leishmaniasis in late adulthood. Am J Trop Med Hyg 2013;88:575-7.